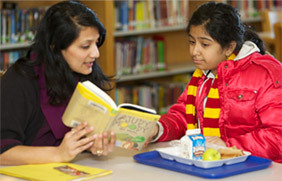 Read to a Child® offers a program designed to make volunteering easy: the Lunchtime Reading Program. One day a week, it brings adult volunteers into elementary schools for read-aloud sessions. Just one lunch break a week is all it takes for a child to become a stronger, more enthusiastic reader. To establish consistency but allow schedule flexibility, volunteers can partner with a coworker to read to their student on alternate weeks. Read to a Child supports volunteers by providing a diverse collection of recommended, age-appropriate books to choose from. Part of the reading experience is choosing a book together, and we do all we can to make finding a favorite story to share and discuss fun and easy. To learn more about the lunchtime reading program, please visit Get Involved. Interested in signing up for the lunchtime reading program? Don’t have a program near you? You can still help!